Dr. Benny Lile was presented with the 2018 Volunteer of the Year award on behalf of WKU in Glasgow last night (Oct. 25) at the 18th Annual WKU Summit Awards. Dr. Lile is a 2012 graduate of the Doctorate of Education program at WKU. He is the current Superintendent of Metcalfe County Schools where he has been a part of the team that expanded dual credit and work study programs; opened a student-run restaurant; and established a band made up of teachers, administrators, students and Metcalfe County Schools alumni. “Dr. Lile was an excellent choice for this award due to his continuous promotion of WKU to Metcalfe County students and his tireless support of the WKU Glasgow Hilltopper Institute,” said Dr. Beth Laves, Associate Vice President, Extended Learning & Outreach. 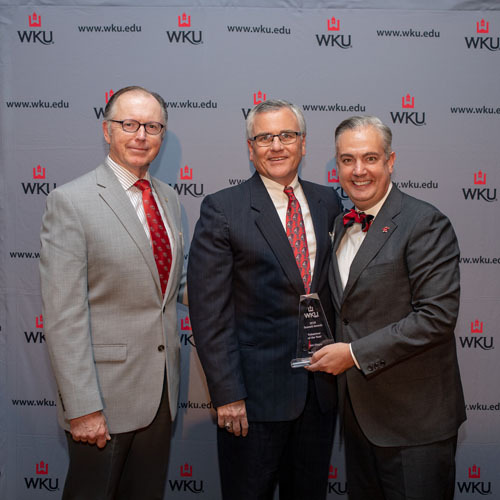 WKU President Tim Caboni presented the award during the annual ceremony, hosted by the College Heights Foundation, WKU Alumni Association and WKU Foundation. The Summit Awards are held on the Thursday evening of WKU Homecoming Week and is an opportunity to honor WKU volunteers who make an impact on the University. Click here for more information about the 2018 Summit Awards.